Please contact Fr. Edlefsen's administrative assistant to arrange a meeting. Fr. Edlefsen is a native of New Jersey, grew up in Louisiana, went to LSU and then UVA for graduate school. He was ordained in 2001 after his seminary studies at Mount St. Mary's in Emmittsburg, MD. Fr. Edlefsen was Parochial Vicar at St. James in Falls Church from 2001-2005, Chaplain at Bishop O'Connell High School from 2005-2007, Chaplain at the Catholic Campus Ministry at the University of Mary Washington from 2007-2014, and he came to St. Agnes in 2014 as Parochial Administrator. On the Feast of St. Agnes, January 21, 2016, he was made Pastor by Bishop Paul Loverde, who formally installed him in March 2016. Fr. Edlefsen loves the great outdoors and hiking, enjoys reading history, novels and stories, comedy, social commentaries and theology. His favorite magazine is Montana Outdoors, though he's never lived in Montana (it's a nice thought). He also loves music, everything from classical to folk. On his day off, you might find him at a secluded place along Potomac River or the Shenandoah Mountains reading a good book. Sts. Bernard of Clairvaux and Therese of Lisieux are among his favorite saints. His hope for St. Agnes is that we grow in holiness as "missionary disciples" of Jesus Christ. He envisions a parish that welcomes people into the fold of Christ's flock so as to become holy in this life and saints for the next. He would like every living room the parish to be a sanctuary of God's peace and charity. You can read more about his background in this Catholic Herald Article. Fr. Sina was born in October of 1973 in Buffalo, NY. He was raised Catholic and graduated from Williamsville South High School in 1991. He received a B.A. in Political Philosophy from Washington & Lee University in Lexington, VA in 1995 and an M.A. in Legal and Political Theory from University College London in the UK in 1996. He then returned to Washington & Lee University to attend the School of Law, receiving a J.D. in 2000. Afterwards, he practiced law in Virginia, West Virginia, and Maryland, primarily focusing on commercial litigation and construction-related issues. He entered Mount St. Mary's Seminary in 2008, graduated in May 2014, and was ordained to the priesthood on June 7, 2014. Fr. Sina served as parochial vicar at St. John the Beloved in McLean, VA from 2014 to 2018. He came to St. Agnes in September of 2018. Fr. 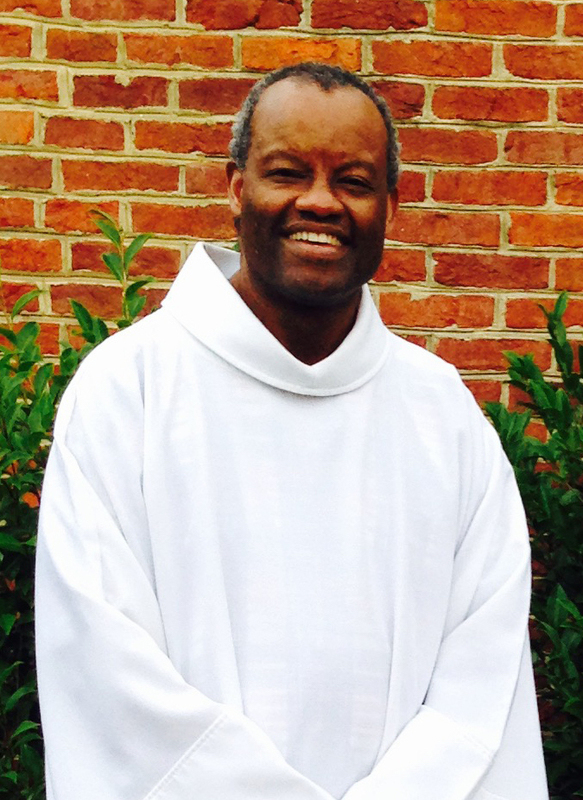 Cedric Wilson, OSA is an Augustinian priest born and raised in Chicago, Illinois. He attended the minor and major seminaries in the Midwest, graduated from Catholic Theological Union in Chicago, and was ordained in September 1978. His assignments have been as a religion teacher/chaplain at Marian Catholic H.S. in Chicago Heights, Illinois (1978-1979); Campus Ministry & Religious Studies Lecturer at Villanova University (1979-1983); and Administrator in the School of Adult & Continuing Education Biscayne College (St. Thomas University) Miami, Florida (1983-1986). Fr. Wilson has completed Masters degrees in Divinity (1978); Developmental Counseling (1986); Psychology and the Doctorate in Clinical Psychology (1999). He has worked with children and families at Johns Hopkins University Hospital in Baltimore as a Psychiatric Therapist for many years. Along with his clinical work, he is teaching courses in the field of Psychology at NOVA and GMU. Fr. Wilson came to Saint Agnes as a priest "in residence" in August of 2008, while continuing his clinical work in Baltimore, and assisting in parishes in the Northern Virginia area. A priest in residence is one who is living at a particular parish but whose primary apostolate work involves something other than parish work (ie. hospital or prison chaplain, teacher, chancery official, or pursuing academic studies). Fr. Wilson enjoys the arts, nature and traveling. His guiding theological principle is: THE GLORY OF GOD IS HUMANITY FULLY ALIVE. Fr. Thomas Tuan Nguyen is a priest of the Bui Chu diocese in Vietnam where he was born and grew up. After graduating from the school of Law at Vietnamese National University of Hanoi, he entered the seminary and was sent by his bishop to St. John Vianney Theological Seminary in Denver to complete his seminary formation. His priestly ordination took place in May 2016 in Denver by the laying of hands of Archbishop of Denver Samuel J. Aquila. Right after his ordination, he was transferred to the Catholic University of America for further studying in philosophy. He stays in residence at Saint Agnes while attending his schooling at CUA. Fr. Nguyen's guiding philosophical principle is "Love takes up where knowledge leaves off" (St. Thomas Aquinas). And his priestly motto is "Nil Nisi Te Domine" - which means "Nothing else but You, O Lord (St. Thomas Aquinas).